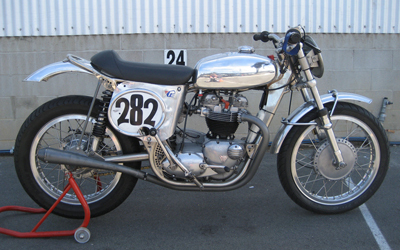 The first photo is of my track master triumph, these frames were built in America by a guy by the name of Ray Hensley, they were designed solely for flat track racing & were the frame of choice for the top riders in the 1969-75 era & were used with Triumph, BSA & Norton motors though it would seem that Triumph power was the most commonly used. The engine in this bike is a very standard `71 TR6 650cc with twin carb head using 30mm mk2 amal`s. At the end of the Triumph era in the USA they were using very potent 750`s putting out up to 72 HP at the rear wheel. I bought the bike as a basket case & it was built up by Don Newell. 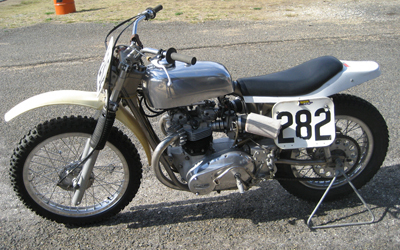 The second photo is of my Cheney Triumph, this was also built up by Don Newell, he was the agent for Cheney frame kits, I supplied the motor wheels & forks, it was originally built for Vintage motocross, I took delivery in 1997 & rode it in motocross for seven years before giving it a change of life. It is also powered by a `71 TR6 650cc in a standard state of tune. The third photo is of my “Maiumph” as I call it. This bike I built up as a pre 78 class vintage motocross bike. The frame is a `77 Maico enduro modified by Vern Grayson to incorporate a new top tube to carry the oil for the Triumph unit 500cc motor, again of 1971 vintage. 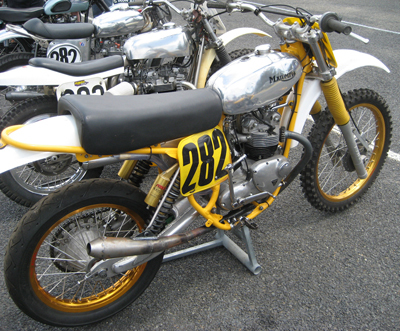 The Sprint meet was the first true race meet for this bike & if it goes as well on the motocross track I will be pleased.